Having the Best whole house tankless water heater installed in your home will help you save hundreds of dollars on gas, water or electric bills. Some designs will perfectly work in homes that rely on natural gas while there are models that will work well with the traditional electrical systems. A tankless water heater refers to a water heater without a tank. It will always heat the water to the required temperature instead of storing the hot water for use. Tankless water heater achieves this by running water through a serious of high-powered burners instead of the gas flame. The tankless hot water heaters are always available in propane, electric or natural gas models. However, the most common models are the natural gas and propane models that are common for large homes. The popularity of the whole house tankless water heater has increased since they provide you with the amount of hot water you require. They are also able to save you money since you will never end up heating dozens of gallons in the tank. The Stiebel Eltron Tempra 24 Tankless Whole House Water Heater can provide you with hot water up to two showers at the same time. Advanced Flow Control System: It includes the Advanced Flow Control that ensures constant temperatures regardless of the demand for water. The water temperature can be quickly and easily set using the adjustment knob and the digital display on the unit front. 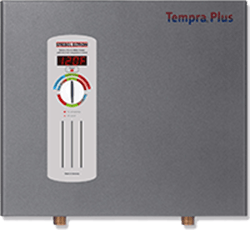 Compact design: Unlike other conventional units, Tempra 24 Tankless Water Heater is sleek and saves a lot of space. Since it does not require any venting, you can fit it anywhere in the house. Constant energy savings: This amazing heater uses intelligent self-modulating technology. It ensures that the least amount of energy is used. Therefore, this heater has been proven to be 90% energy efficient. Cons: You need the expensive 2*6 wire to install the Tempra 24. If you do not mind that, this heater can be the right choice for your family. The Takagi TH3SDV TH3 Series are known for their great sleek design. They are considered to be the most compact unit. 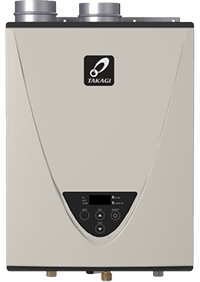 However, the Takagi TH3SDV TH3 Series is larger compared to many tankless water heaters. 8 GPM: It can meet the needs of a full home that contains up to three bathrooms. The water heater delivers up to 6.6 gallons of the hot water just in a minute and has an outlet and inlet thermostats for constant monitoring of temperature. Having the unit is like installing a 40-gallon tank water heater. Energy factor of .95: This whole house tankless water heater is an energy star qualified with an energy efficiency of 95%. Compact design: This heater uses allowable PVC venting system. This system enables it to be installed in tight spaces without ever thinking about combustion. Cons: Installation of the Takagi TH3SDV TH3 Series requires a venting system. It might seem like a little extra work for some people. This is one of the best whole house tankless water heaters. It will always ensure that you never take another cold shower in your life. Though there are many other tankless hot water heaters on the market, the positive reputation and the goodwill that comes with the Rinnai RL94eN Natural Gas Tankless Water Heater cannot be found anywhere else. The Rinnai RL94eN Tankless Water Heater is the best choice for any family interested in higher GPM and hot water usage. Sleek design: It has an excellent sleek design and always available in attractive compact design and silver color that has a simple exterior installation system. 9.4 GMP: It has a capacity of 9.4 GPM hence a great solution for large families. It is designed with the ability to provide not- fluctuating, uninterrupted hot water through five plumbing outlets at the same time. 30-degree Fahrenheit rise: It also offers up to 30-degree Fahrenheit rise from the ground level. It is energy efficient hence qualifies for the Federal Tax Credit. It reduces the energy bills up to 40%. Cons: It is only available for larger families. I mean you can use it even if you have a small family, but that would mean an only waste of money. 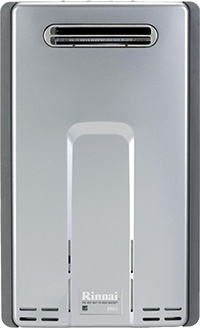 The Rinnai RL94eN Tankless Water Heater is durable and backed by a great warranty plan. So it can be regarded as one of the most suitable whole house tankless water heaters. You don’t have to worry about getting extra space for your new water heater in your home when you have the tankless water heater. You need to ensure that you find the best whole house tankless water heater for your home when you are shopping for one. 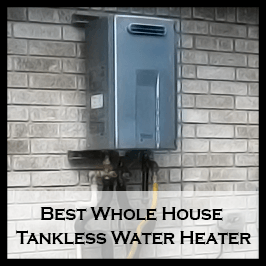 Consider the following when buying the whole house tankless water heater. Any traditional water heater will have space inside to bring water up to temperature. However, with the best tankless hot water design, there is no tank for perfectly heated water at your disposal. You, therefore, need to ensure it has the right capacity that will be able to meet your family needs. You need to consider the flow per minute too. Flow per minute refers to the amount of water the heater will be able to bring up to a temperature within a minute. Most of the tankless models provide up to three gallons or more in one minute; that is an enormous amount for taking a shower and washing dishes. The water heaters having LCD or digital display at the front are always easier to use. It is possible for one to adjust the temperature of the water and make other settings changes using the front buttons. You will still have to consider the overall size of your desired tankless hot water heaters though they are known to take up less space than their traditional counterparts. Most of the designs are always available in compact shapes that are never bigger than an average suitcase. It will reduce the amount of work you will require to have one installed in your home. The right tankless water heater for you will depend on whether you have the gas or electric lines. If you purchase a gas heater yet you have electrical lines, you will have to spend more to have it installed. It is appropriate that you ensure the heater works well with your existing system. The water will always heat up to a temperature range of about 105 degrees Fahrenheit whenever you are taking a shower. Some people prefer the waterless warm while taking showers. If you are one of them, you need to ensure the temperature range the heater can support. Though it is not necessary for all the tankless water heater buyers, there are those who would consider the heaters energy efficiency rating. Energy efficient rating refers to how efficient the heater works. There are many models of tankless hot water heaters available on the market today. However, to enjoy great benefits with moderate challenges, you should go for the best whole house tankless water heaters listed above. If you still have questions about the tankless water heater, please contact us.